Regardless of which model you choose, BYOD needs to be carefully planned to get the full benefits without increasing costs. Decisions must also be made about whether to accept some cost increases as a trade-off for benefits that improve your bottom line. To be successful, both for the business and for employees, BYOD must balance conflicting expectations to create an equilibrium in which both parties get what they want – while also each giving something in return. Many factors will influence the true cost of your BYOD program, but the decision should not be based purely on cost considerations. 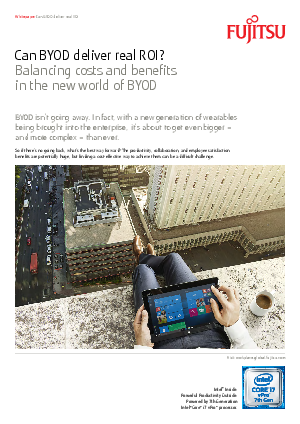 Research by analyst firm Forrester found that nearly 70% of companies increased their bottom line revenues as a result of deploying BYOD programs5 – so some cost increases may well be a price worth paying.